With less than a week to go until the 31 January deadline, freelancers and self-employed workers across the country will be scrambling to complete their submissions. So, are you up to speed with the latest tax rules for the self-employed? At HMRC’s last count, more than three million people are yet to file their tax return. The self-employed make up a large portion of self-assessment taxpayers. If you’re among those who haven’t yet filed, we’ve picked out some tips to help you complete your return and minimise your bill. The way you kept your accounts during the 2017-18 tax year will influence what income you need to report and which expenses you can claim. If your business or trade is fairly straightforward, you may have opted for cash basis accounting. This means you’ll only need to pay tax on income that you have actually received, and can only claim for expenses that were paid during that period. Otherwise, if you used traditional accounting (known as the accruals basis), you’ll need to record payments that were due during that period, regardless of whether money has changed hands. However, you’ll also be able to claim expenses that were due, even if they’re unpaid, and write off bad debts if there’s no likelihood of recovering the money. As a self-employed person, you’ll pay tax on your profits, rather than your income. As such, it’s important to deduct all your costs of doing business from your taxable income so you don’t overpay. Generally, the way to think about expenses is that they’re costs you incur, not investments. Common expenses include heating, lighting, cleaning, rent and business rates for your business premises. You can also claim some costs for business trips, including travel and accommodation and some meals on overnight trips. Making a loss can be a blow when you’re in business for yourself, but that loss can help offset future profits. If you made a loss in recent tax years from your business, you may be able to apply it to this year’s profits to bring down your total bill. When you use your car to travel for business, you can claim a flat rate for each mile you drive – 45p per mile up to 10,000 miles, and then 25p per mile for anything over. Keep in mind that this doesn’t apply to commuting or to any personal travel. If you work from home, you’ll need to use a formula to work out which expenses you can claim, based on what portion of your ‘business’ space takes up in your home and how often you use it. For example, say your study makes up 10% of the total floor area of the home and you use it five days out of seven (71%). For any bills you receive – including heating, electricity or council tax – you’d take 10% of the total, then 71% of that amount, to work out how much you could claim. While you can’t claim business investment as an expense, there may be other tax reliefs you can claim. The Annual Investment Allowance (AIA) rules mean you can claim relief on up to £200,000 investment in 2017-18, and that figure remains the same in 2018-19 and 2019-20. If you, for example, spent £20,000 on machinery for your business, and had a taxable profit of £100,000, then you’d only need to pay the difference, in this case £80,000. Your relief can’t be more than the tax you owe. When working out your bill is likely to be, it’s worth getting your head around the various allowances that might apply to your income. You can benefit from a higher personal allowance in the 2017-18 tax year of £11,500, up from £11,000 in the year prior. But bear in mind that your personal allowance will decrease by £1 for every £2 you earn over £100,000. The capital gains tax allowance was also larger in 2017-18; you were able to earn £11,300 in profits from selling assets, compared with £11,100 in the year before. The dividend tax allowance was £5,000 in 2017-18. But this will drop to £2,000 for 2018-19, which is likely to affect your return next year, especially if your company pays you as a dividend. Larger businesses are obliged to be VAT registered, meaning they charge VAT at 20% on the services and products they sell, but can claim back the VAT they buy. If you’re a smaller business or sole trader you must register if your turnover is more than £85,000, but you can register voluntarily if you are on less. It may be worthwhile if you pay a lot of VAT on the items bought for your business. After you file your tax bill, you’ll be told how much tax you still owe for the 2017-18 tax year. However, if your last tax bill was more than £1,000, you may also be required to pay an instalment towards the 2018-19 year – generally 50% of the previous year’s bill. So, for example, if your total bill for 2017-18 came to £9,000, you’d be asked to pay the balance of that bill as well as £4,500 on the 31 January towards the next tax year. You can’t pay on credit card, so make sure you have the funds available. If you can’t pay your bill, get in touch with HMRC as soon as possible. It may sound obvious, but keeping your receipts and paperwork in good order will take hours off the time you need to file your tax return. If you’re self-employed, you need to keep your records for at least five years after the 31 January submission deadline, so this records for this year’s return should be kept until the end of January 2023. Tracking your income and outgoings each month using a spreadsheet, or specialist software such as the Which? 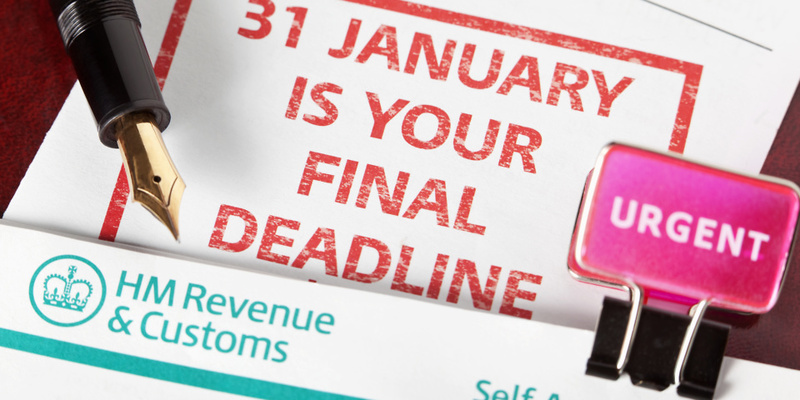 Tax Calculator will help avoid that last minute scramble to beat the deadline if you leave things until the last minute. The Government’s Making Tax Digital will mean self-employed businesses and landlords can start keeping their business records digitally, and send income tax updates directly through HMRC through software, instead of filing a self-assessment return. For now, the scheme is just a voluntary pilot, though it’s supposed to become mandatory in the next couple years. You can join the pilot if you’re a sole trader with an income from more than one business, or if you are renting out a property in the UK (excluding furnished holiday lettings). Find out more at on the Gov.uk website. 12. File your tax return with Which? Some websites and apps can help you work out your tax bill and submit your return directly to HMRC, including Which?’s own Tax Calculator. It’s officially recognised by HMRC, and as well as helping you work out what you owe, can help prompt you with tips on allowances and expenses you may have missed. It allows you declare a wide range of taxable income and capital gains, including from employment, self-employment, interest and dividends, property, pensions and trusts.